GRADUATION ～それぞれの明日～'s pop'n music banner. furikaettara itsu demo jibun no ibasho ga atta kara ka na? The full version of GRADUATION ～それぞれの明日～, titled GRADUATION ～それぞれの明日～ (FULL VERSION), can be found on the DanceDanceRevolution EXTREME ORIGINAL SOUNDTRACK album. A different long version of GRADUATION ～それぞれの明日～, titled GRADUATION (New Vocal & Mix), can be found on BeForU's KI·SE·KI album. A different arrangement of GRADUATION ～それぞれの明日～, titled GRADUATION ～それぞれの明日～ (unplugged version), can be found on BeForU's first album, BeForU. An instrumental version of this arrangement appears in the video inside KI・SE・KI, also in the KI·SE·KI album. GRADUATION ～それぞれの明日～ was used as the credits song in DanceDanceRevolution EXTREME. The DanceDanceRevolution EXTREME ORIGINAL SOUNDTRACK booklet does not list the game size lyrics for GRADUATION ～それぞれの明日～. It does, however, list the full version's lyrics. GRADUATION ～それぞれの明日～ is one of the crossovers part of pop'n music 12 いろは's pop'n hiden ninpouchou (ポップン秘伝忍法帖) event. It could be unlocked through the HARU (春) scroll from March 2nd to April 13th, 2005. According to pop'n music 12 いろは sound director wac, there were plans to make an original song for the game on high school graduation, until he remembered GRADUATION ～それぞれの明日～. GRADUATION ～それぞれの明日～'s pop'n music preview is the same as the one used in DanceDanceRevolution, only shorter. "Sotsugyou" (卒業) is Japanese for graduation. おしゃれずきん does not have a 2P color. GRADUATION ～それぞれの明日～ was performed on the RIYU KOSAKA FIRST LIVE at O-EAST 2005 and BeForU LIVE 2006 concerts. GRADUATION ～それぞれの明日～ is one of the BeForU songs revived in pop'n music 19 TUNE STREET from their previous removal in pop'n music 17 THE MOVIE, along with ☆shining☆, CANDY♥, and BRE∀K DOWN!. GRADUATION ～それぞれの明日～ was still present in the location test of DanceDanceRevolution X, with its new foot ratings. GRADUATION ～それぞれの明日～ is one of the unlockable revivals in DanceDanceRevolution X2. It can be unlocked by reaching ENJOY LEVEL 86. 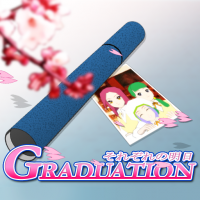 As of February 23rd, 2011, GRADUATION ～それぞれの明日～ has been unlocked for normal play. GRADUATION ～それぞれの明日～ received a slightly modified version of its DanceDanceRevolution EXTREME movie in DanceDanceRevolution (2013). It can be unlocked by first unlocking Elemental Creation from the Shiritsu BEMANI gakuen (私立BEMANI学園) event. This video is played full-screen and eliminates any on-screen dancers. The ads in GRADUATION ～それぞれの明日～'s video were changed: "Biker Mikoshiba" (バイクの みこしば) and "Instruments Maeda" (まえだ楽器) were changed to "Sorry to keep you waiting! Super TAG" (おまたせしません! スーパーたぐ) and "Cameraman Asami" (カメラのあさみ), respectively. In DanceDanceRevolution A however, its original EXTREME video is shown when GRADUATION ～それぞれの明日～ is played from the DDR SELECTION folder. According to Riyu Kosaka, GRADUATION ～それぞれの明日～ is one of her favorite BEMANI songs. GRADUATION ～それぞれの明日～ was supposed to appear in the cancelled game カラオケレボリューション BEMANIシリーズセレクション. AKI (秋) Hell? or Heaven? - Klungkung 1655 - KOUYOU - Trick or Treat! - もりへいこうよ - 進め!爺ちゃん! This page was last edited on 1 April 2019, at 12:46.